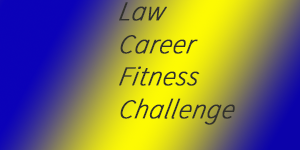 Let’s start the Law Career Fitness Challenge with an easy one. Go to the nearest mirror and take a long, hard look at the face staring back. Say hello. That’s the person in charge of your professional well-being. Sure, other people will influence your career choices. So will outside circumstances. But ultimately, the buck stops with you. Think of professional fitness the same way you think of physical fitness. Neither just happens. You don’t wake up one morning to find you’ve stopped smoking, dropped ten pounds or developed six-pack abs. And nobody – no mentor, headhunter or guru – can do it for you. It takes focus, effort and persistence. And it starts with the intention of assuming ownership for whatever happens – good, bad or blah – in your professional life. This is harder than it sounds. After enduring the whirlwind known as law school, you then face the stress of taking the bar exam and the strain of finding a job. It’s easy to feel like a cork bobbing along a raging river of circumstances. And so we make decisions out of fear, desperation or a desire to please others. We make choices based on financial concerns (“I’ve got to pay off my student debt”) or market conditions (“There are no jobs out there, so I’ll take anything I can get”). Small wonder, then, that so many lawyers find themselves stuck in jobs they don’t like – or even actively hate. In fact, according to this survey, the unhappiest job in America is associate attorney, ranking ahead of even customer service in terms of dissatisfaction. Make a list of the top worries keeping you up at night. Next week’s torts final? Passing the bar exam? Getting a job? Under each entry, write down what you see as the cause of the problem. Circle every cause that is external – i.e., outside your control. If you end up with a paper filled with circles, you may be suffering from responsibility avoidance. Now take that same list, and for each of your main worries, write down specific, concrete steps you can take to improve the situation. Stop saying “I should” or “I have to” or “I need to.” These words feed a mentality of powerlessness. Don’t waste time complaining and blaming. It distracts you from finding solutions and makes you unpleasant to be around. Create new habits. Start riding a bike to class. Take a course that is outside your comfort zone. Smashing through fixed behaviors can open up unimagined new opportunities. We all want to be the driver, not a passenger, on our life journey. Yet too often we float along, buffeted by outside forces and happenstance, until one day we look up and ask ourselves – like David Byrne in “Once in a Lifetime” – how did I get here? Taking responsibility for your career – the good and the bad, the ups and the downs – is empowering. It’s liberating. You’ll believe you can handle whatever comes next. And that will make you a success by any definition.